One of Playtech’s popular Greek mythology themed Age of the Gods range of games, Fate Sisters is a five reel and three row slot that takes the three fates as its main focus. Utilising images of the fates for its symbols, as well as other related imagery, the game is linked to not one but four progressive jackpots and also boasts a number of special gameplay features, alongside its own impressive payline jackpots. At the highest possible bet level, the top Age of the Gods Fate Sisters payline jackpot can be worth a truly life-changing £1 million. Aside from that wonderful payline jackpot, the slot is also linked to four separate progressive jackpots. Alterable active paylines and line bet amounts provide a wide range of staking options. Fun features such as wild symbols, scatters and three different types of ‘Fates Portal’ free games make gameplay really immersive. Apart from the very annoying harp style music – which can thankfully be easily turned off – there is very little to criticise Age of the Gods Fate Sisters for. Before you even get to the numerous additional features of the Age of the Gods Fate Sisters slot, the game offers players the chance to win exceptional payline jackpots. 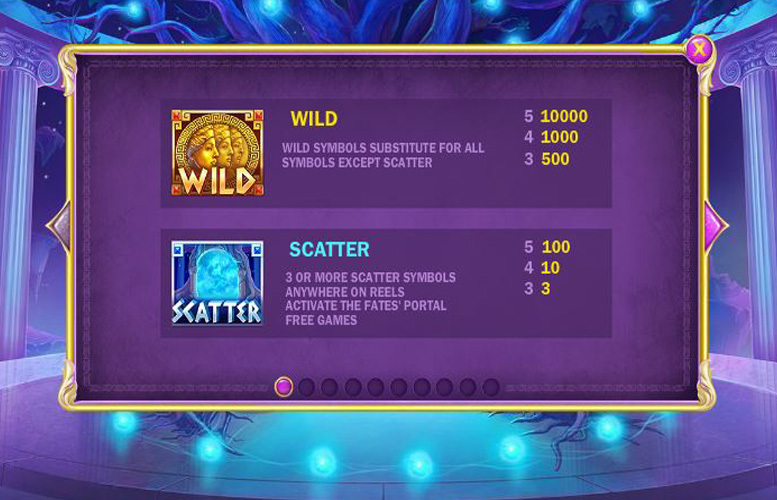 The best of those jackpots result when five matching symbols line up along an active payline and the most valuable symbol of all is the game’s wild symbol. 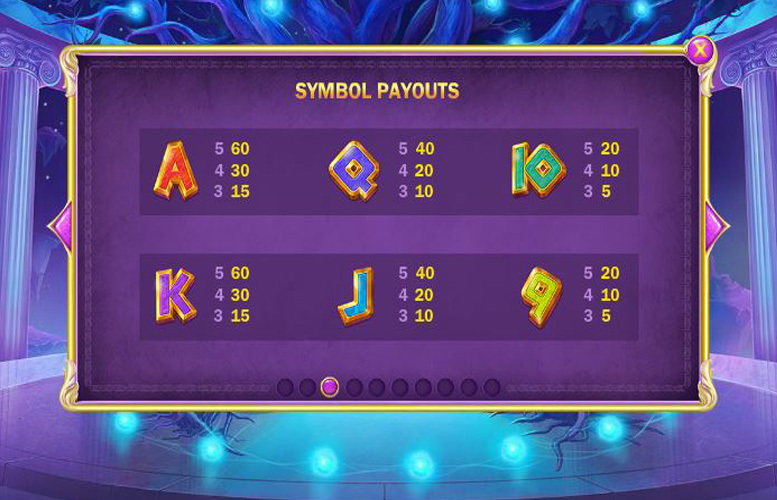 If five of those wild symbols do appear on an active payline, the resulting jackpot will be worth 10,000 times the player’s chosen bet per line. The highest possible bet per line stands at £100, meaning that the slot’s top payline jackpot can be worth a princely £1 million. If the sheer size of that jackpot isn’t enough to impress you, Age of the Gods Fate Sisters is also packed full of additional features. The most notable of those are its linkage to four progressive jackpots, its wild symbols, the ‘Sisters’ Gift’ feature and three types of ‘Fates Portal’ free games. Like all of Playtech’s Age of the Gods titles, Fate Sisters is linked to the Power, Extra Power, Super Power and Ultimate Power progressive jackpots. The Jackpot Game is triggered randomly and which of the four jackpots that a lucky player then wins, is determined by the choices they make in that game. We’ve already explained how the Fate Sisters wilds can form the slot’s most valuable payline combination, but they also work in the more traditional fashion. That is that they can substitute for all symbols, other than scatters, to make up the most valuable possible payline combination. 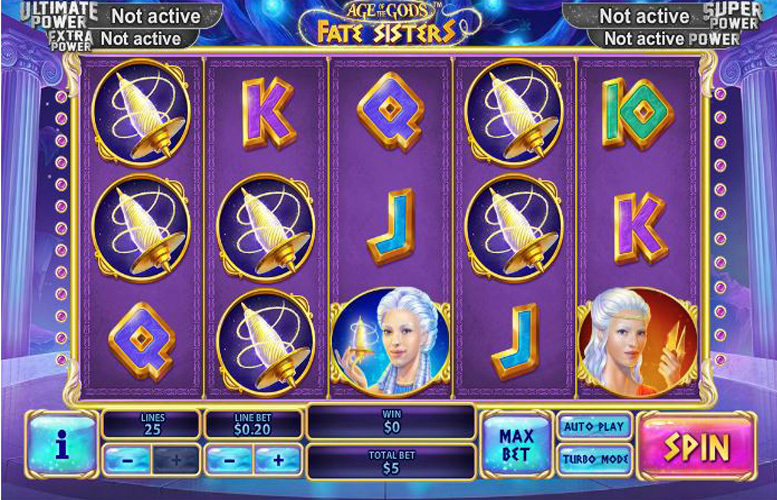 The Age of the Gods Fate Sister slot features a symbol depicting each of the three fates. If the green fate symbol appears on reel one, the blue on reel three and the orange on reel five at the same time, the Sisters’ Gift feature is activated. That feature leads to one re-spin where the aforementioned symbols stay in place and then payout as extra scatter symbols. 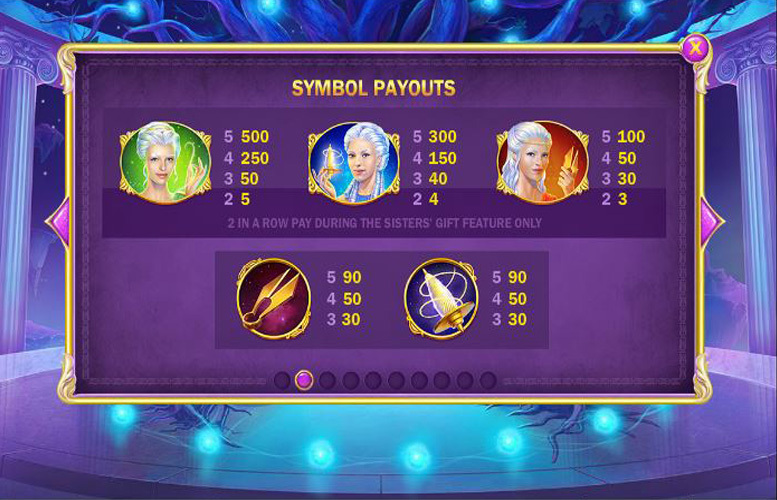 As well as providing instant payouts, the Age of the Gods Fate Sisters scatter symbols also trigger free games if three or more appear at once. There are three different types of free game, each linked to one of the three fates, and players can choose which they wish to receive. Different numbers of the games are triggered and they all have different and specific special features. The regular symbols on the Age of the Gods Fate Sisters reels are either depictions of playing cards or images of the three fate sisters. It is those fate sisters symbols that are most valuable, with the green one being most valuable, the orange being the least valuable and the blue being in the middle. If five of the green fate symbols line up along an active payline, the resulting jackpot will be worth 500 times the player’s chosen bet per line. Five of the blue symbols pay out at a rate of 300 times the line bet and five of the orange symbols trigger a jackpot of 100 times the bet per line. Age of the Gods Fate Sisters players have a plethora of options when it comes to how much they wish to bet per spin. They can, after all, alter the number of active paylines and the size of their bet per line. The slot has a maximum of 25 paylines that can be active at any one time, and any number from that maximum down to just one can also be selected. The size of the bet per line, meanwhile, can be set as low as just 1p or as high as £100, meaning that total bet limits are 1p at the lowest and £2500 at the highest. Age of the Gods Fate Sisters is a slot game that truly has something for everyone, managing to combine outstanding potential jackpots with really immersive gameplay and a fun and interesting overall theme. Being linked to four different progressive jackpots represents the first way in which the slot can provide life-changing winnings, but its own payline jackpots are also impressively generous. The very highest of those jackpots, after all, can be worth a fabulous £1 million and lower payouts still remain sizable. On top of that excellent winnings potential, too, the Age of the Gods Fate Sisters slot also offers a whole host of fun features. Wild symbols and scatters increase players’ chances of winning and the latter also triggers innovative and potentially valuable free games. This game has a rating of 5 / 5 with 834 total reviews by the users.